Pempek or Empek-empek is the special food from Palembang, South Sumatra. 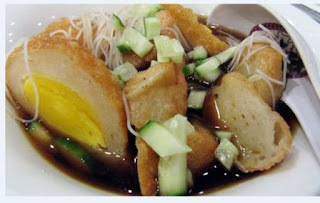 Pempek palembang is made from sago flour and fish that serve with, dark and rich sauce named cuko. Cuko can be made of chili, brown sugar, salt, vinegar, garlic to boiling water. In Indonesia, there are many types of Pempek. The most well known is Pempek kapal selam that is made from chicken eggs wrapped in dough and then fried pempek. Pempek this kind of a high percentage of vitamins, minerals, proteins and carbohydrates content that is the most nutritious items. As a Local food, Pempek can generally be found in every Palembang Street. If you want to enjoy eating Pempek Palembang, you can try making that by yourself at home. Grind over all the ingredients, unless tapioca flour. Mix overall well. Take 1 tablespoon of the mixture of fish, add about 2-3 large tablespoons of sago flour, mix to form pempek as you wish. Set aside the formation of the rest of the dough until the end. Boil the water using a frying pan and cook the pempek about 15 minutes. When they come to the surface, meaning it was cooked. Set aside. To make the cuko, boil water with all ingredients until sugar was dissolved. Grind the sauce using a food mill or a hand mixer. Place the Pempek on the plate by cutting into small pieces. You can add the noodles and pour the soup. Garnish it with the cucumber. People love to add ebi. That’s all about how to make delicious Pempek Palembang.